Kaprunerthal is located in Salzburgerland, in the Pinzgau. It’s a typical glacial side valley, running south from Zell am Zee towards the Gross Glockner. The town of Kaprun lies at the northern end. The valley has majestic Alpine scenery; in summer it is full of walkers & climbers; marmots can be seen. In winter, skiers take over. These cards shows the upper valley before the dams were built. Three philatelic phases can be identified. 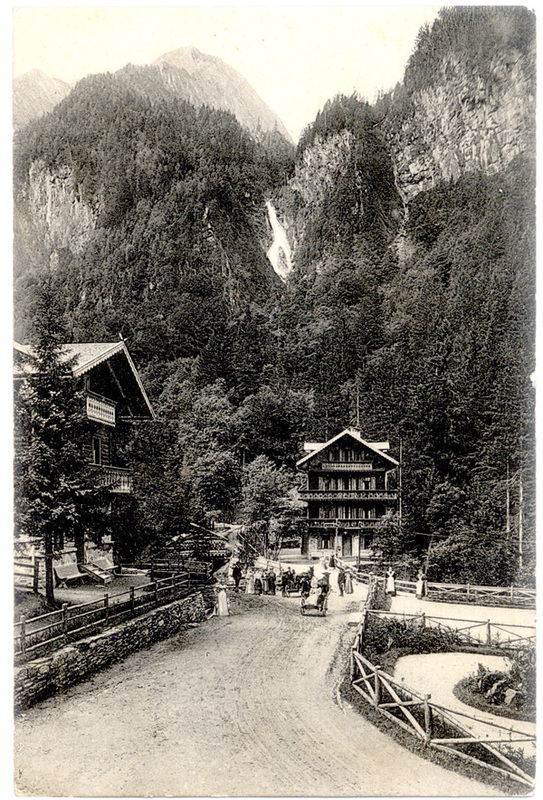 These two hotels were opened towards the end of the 19th century, and at first were served by an Austrian government post office in the Alpenhaus and a Postablage at Moserboden. 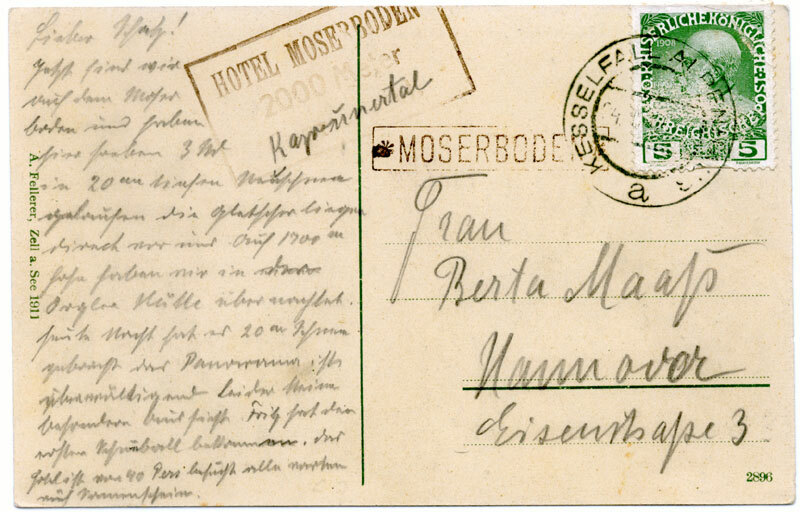 Moserboden used the standard boxed * MOSERBODEN * Postablage mark from 21 July 1904. It is recorded from 1904 to 1914 in black and violet, and the office was supposedly open from 15 June to 15 Sept each year. It seems to have been closed during WWI, reopening in 1920 for a couple of years. 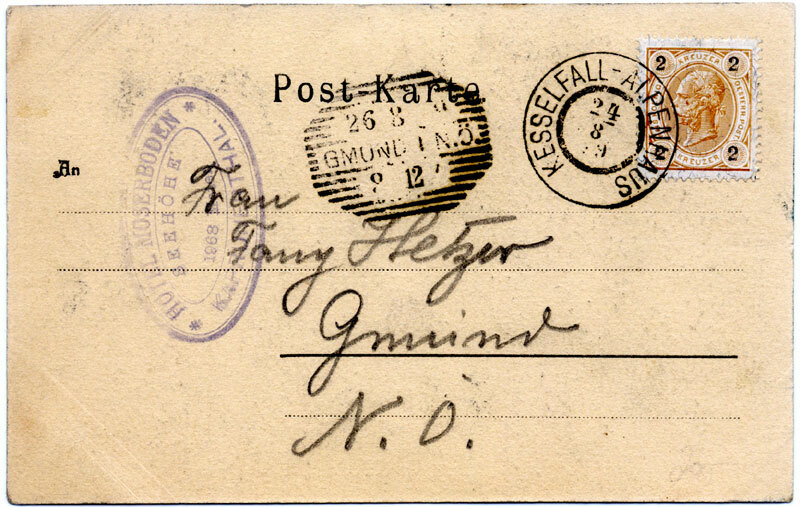 Mail from it was carried by the postperson to Kesselfall Alpenhaus (where there was a summer Post Office) for franking. 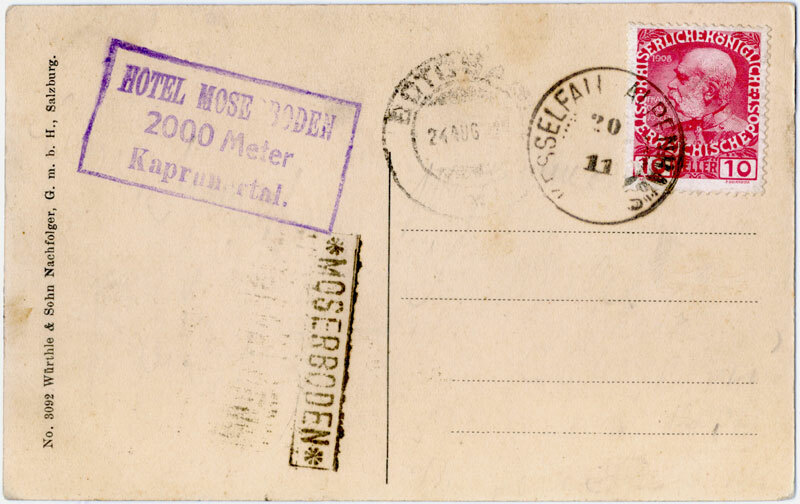 Postcards sold at the hotel also received a 3-line boxed Hotel Cachet in violet or black: HOTEL MOSERBODEN / 2000 Meter / Kaprunerthal but one could bring ones own card and post it, receiving only the Postablage mark. The two cachets are not always in the same colour, further showing that they were applied separately. Oddly, before the Postablage opened the hotel cachet was oval and the hotel's height only 1968 meter - indeed a 1900 example has 1968m on the picture side and 2000m on the cachet. Yes, the Alps are rising, but not that fast! 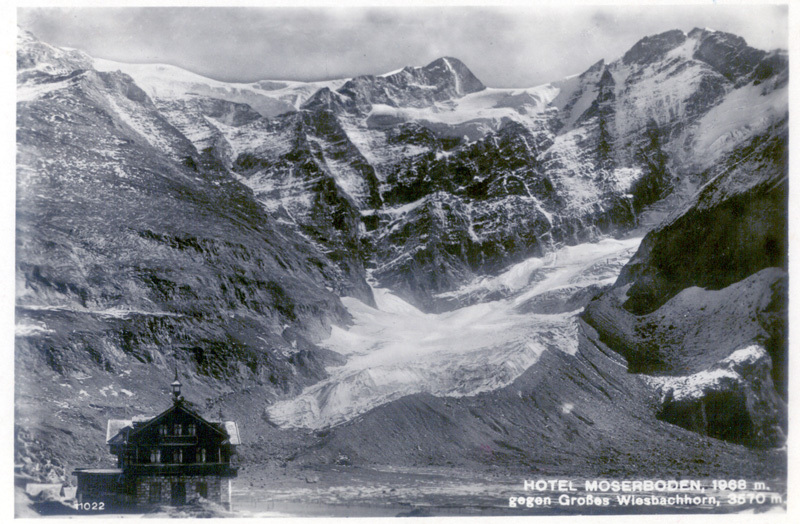 The original Moserboden hotel – note also the Münchner-Haus perched near the top of the left-hand Alp. The franking arrangements at the Kesselfall-Alpenhaus are more complex. 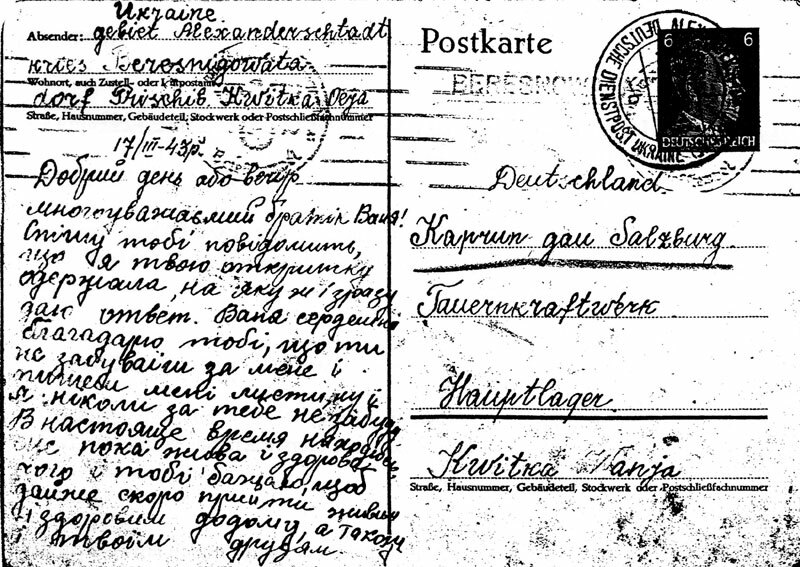 Kühnel records it as operating as a Postablage; three cachets are listed. Kühnel adds that it was also a Summer Post Office from 1896. He doesn’t record the closing date. 1. Double circle, 27mm dia, with KESSELFALL-ALPENHAUS (but no star) between the circles and the date in the middle, formatted in 3 lines DD underline MM newline YY. This was used from ‘1900’ to 1911 (Stohl uses ‘1900’ to include ‘opened before 1900 and remained open till 1900’). My examples suggest that the inner ring wore badly; it is clearly visible in 1899 but by 1910 is scarcely noticeable. 2. Ring cancel, 30mm dia, with KESSELFALL-ALPENHAUS a in the rings and the date between the straight lines formatted as DD MM YY TT with the month in roman numbers and a time (which may be shown as two dashes). Recorded from 1911 to 1934. The hotel proprietors organised a carrying service; and in the mid-twenties issued two stamps to cover the 5 groschen fee. The stamps had a black centre; one had a blue frame and the other had a green frame. 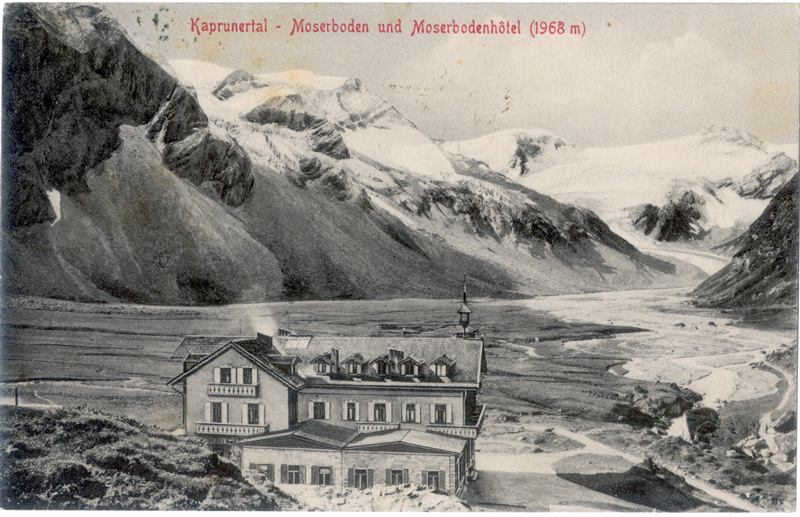 Each stamp showed a view of the hotel whose name, in black, appeared at the top of the design, one being Kesselfall-Alpenhaus and the other Moserboden. In use the local stamps were interchangeable, and were cancelled in purple or black with a large, three-lined mark inscribed "Moserboden / Kaprunerthal 2000 m. / Bahnstation Zell a. See." 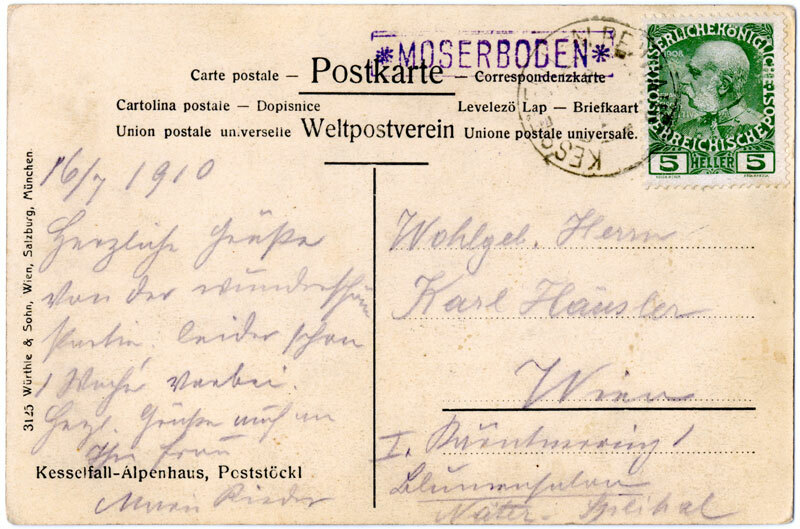 Also, a normal Austrian adhesive stamp was needed for onward postage. 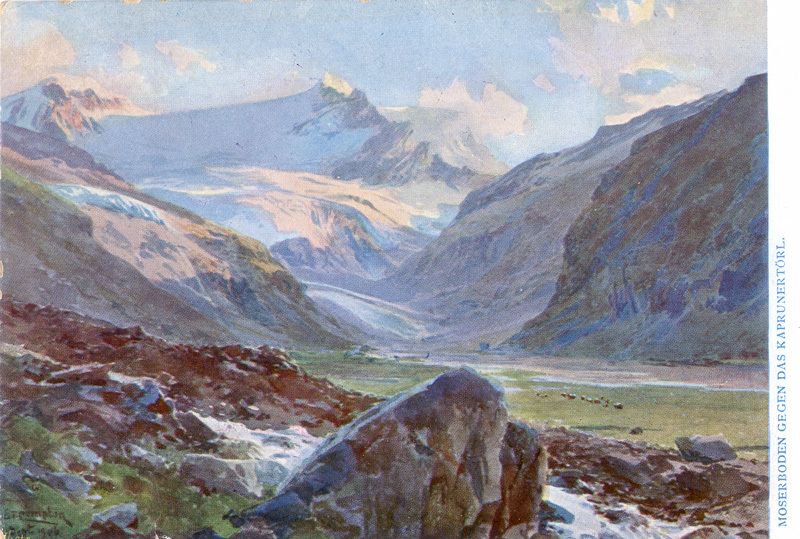 This view is of the Kesselfall-Alpenhaus. 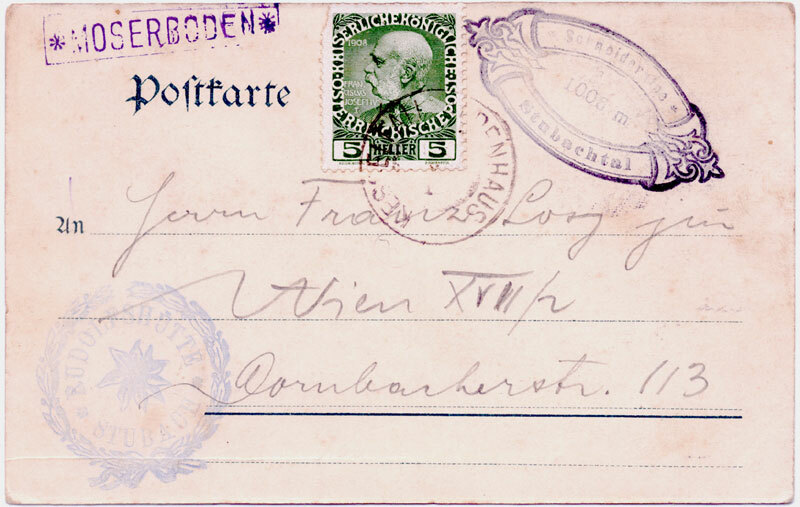 The card above shows a brand-new double circle KESSELFALL-ALPENHAUS cancel from 24 Aug 1899. There is definitely no star. 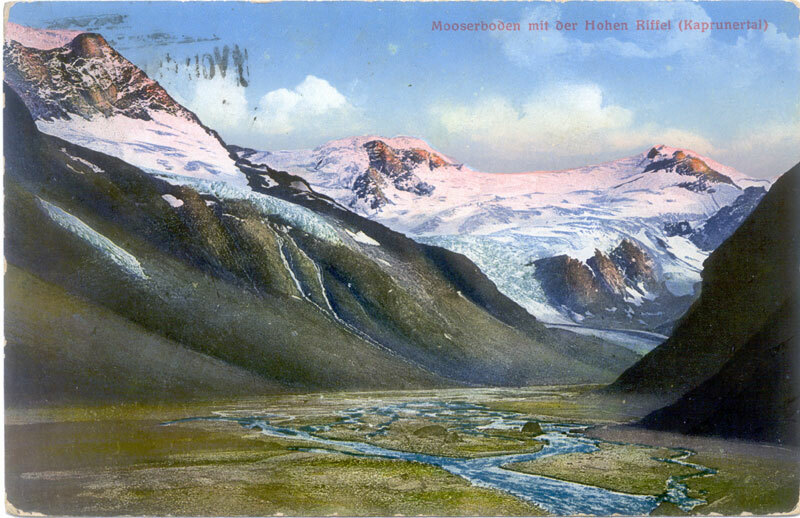 The faint oval cachet is Moserboden 1968m. This card is from Aug 1900, still 1968m & no star; the cancel is slightly worn. This card shows the double circle KESSELFALL-ALPENHAUS cancel in a very worn state; the card is dated 16 July 1910. 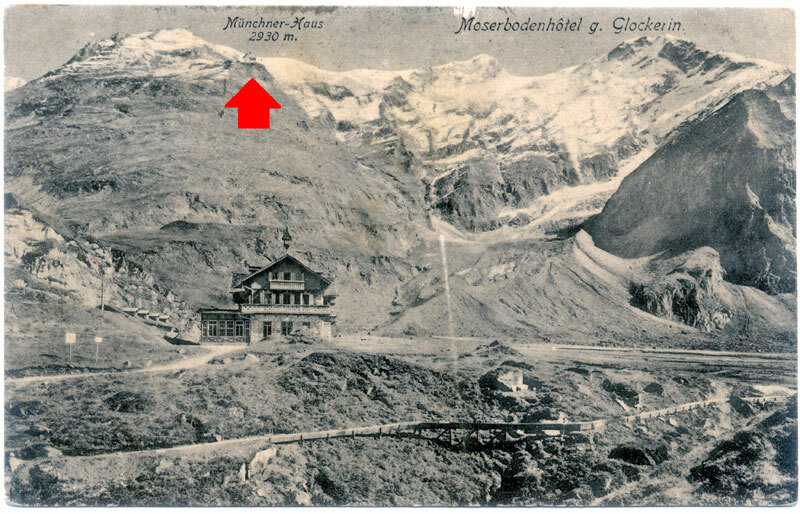 The picture on the card is of the Alpenhaus, and the absence of a Moserboden hotel cachet shows that it was carried up by its writer and posted there. This card shows the ring cancel; the date is unreadable. Note the curious scuffing on the adhesive, which seems to be a printing flaw as the paper surface is intact. 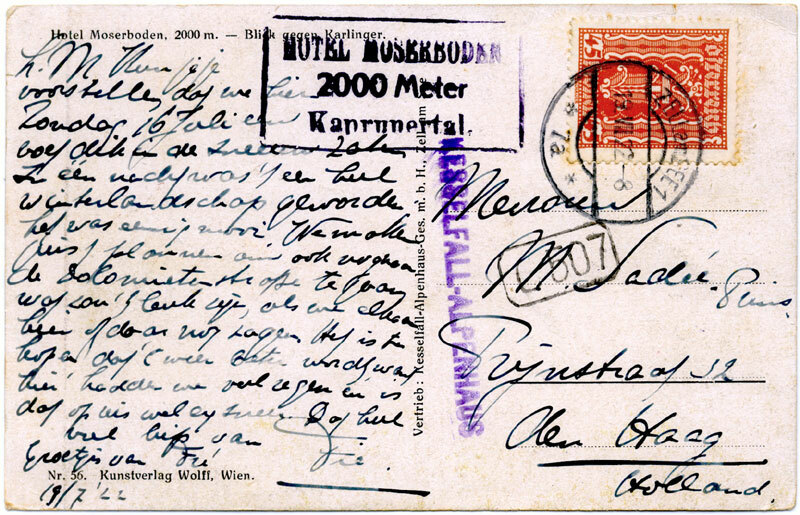 The hotel has risen to 2000m, and the cachet is so faint that the sender has rewritten the Kaprunerthal in pencil! The Postablagen cancel is black. Again, the worn double-circle cancel, for 20 Aug 1911. 2000m hotel cachet in violet and the Postablage in black. Both address and message were in pencil and have been erased; the arrival cancel might be Swiss as the 10h is the foreign postcard rate. 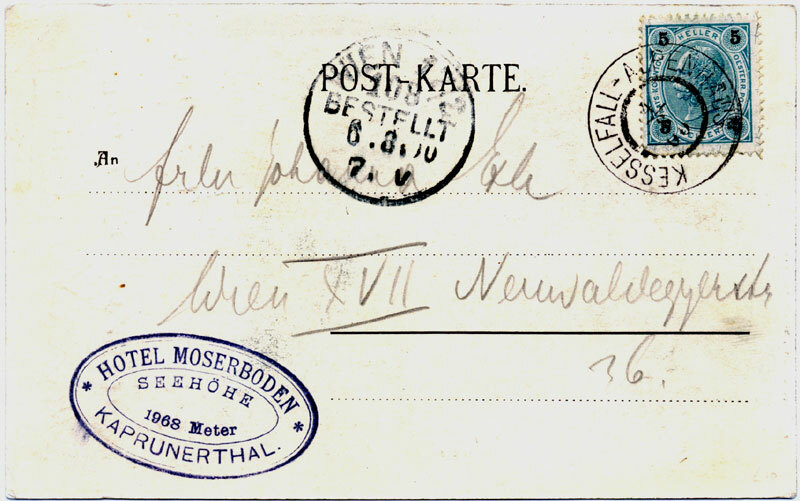 45 kr adhesive cancelled on 19 July 1922 at ZELL am SEE 1. Moserboden Hotel cachet; the KESSELFALL-ALPENHAUS may be Kuhnel’s third postablage cancel but it does look very like a hut cachet. Note the Dutch delivery-round mark. The Kesselfall-Alpenhaus post office must have been shut. The terrain plus the weather gave rise to severe flooding in many years; and the loss to Austria of the Czechoslovakian coal fields meant that the First Republic was short of energy. Plans were developed to solve both these problems by a huge hydro-electric scheme – but the plans far exceeded Austria’s capabilities. With the Anschluss came new ideas, new funds, and new labour – the latter being refugees and POWs. The first electric power was generated on 17 Nov 1944, from temporary constructions. The labour camp lay underneath the waters of today’s lower reservoir; and most history books don’t cover these events. However the 50th anniversary exhibition at Kaprun in 1994 did; and produced a leaflet summarising the true history as well as noting the many myths. Some of the "guest workers" were Ukrainian - an estimated 2 million! 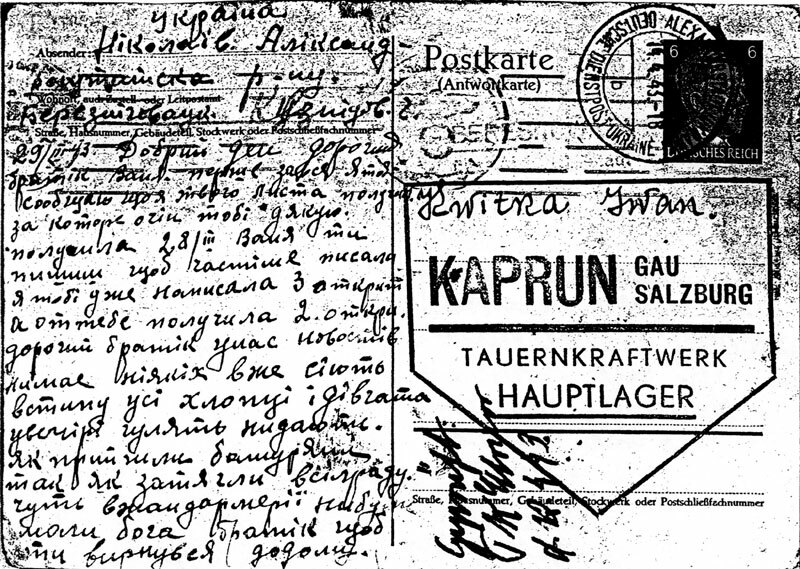 They were provided with reply-paid cards to send and receive messages from their homes; the replies are cancelled ALEXANDERSTADT (UKRAINE) DEUTSCH DIENSTPOST UKRAINE. In 1945, the power industry was in a disastrous state. In the course of World War II, extensive destruction resulted in an almost absolute interruption of power supply in Austria. It was only the public sector that was capable of coping with the repair and construction work required in the field of electricity generation. 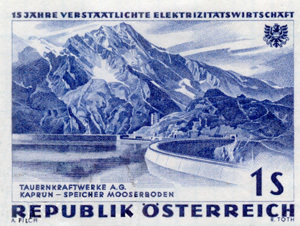 Thus, the Austrian parliament adopted the law on the nationalisation of Austria’s power industry on March 26, 1947. The large-scale production of electricity was entrusted to specialised companies organised as joint-stock corporations in which the federal state had to hold a share of at least 50 %. The Verbundgesellschaft, a central holding company entirely owned by the federal state, was created to ensure the large-scale distribution of energy in Austria. For that purpose, it operates a long-distance, high-voltage cable network, while provincial companies are responsible for the distribution to the consumers in the individual provinces. Additionally, there are municipal electricity utilities (in the provincial capitals) and power plants owned by industrial companies. Kaprun power plant, which is a storage power station, and the two dams shown in this stamp - Drossensperre and Moserbodensperre - were constructed in the years from 1952 to 1955. 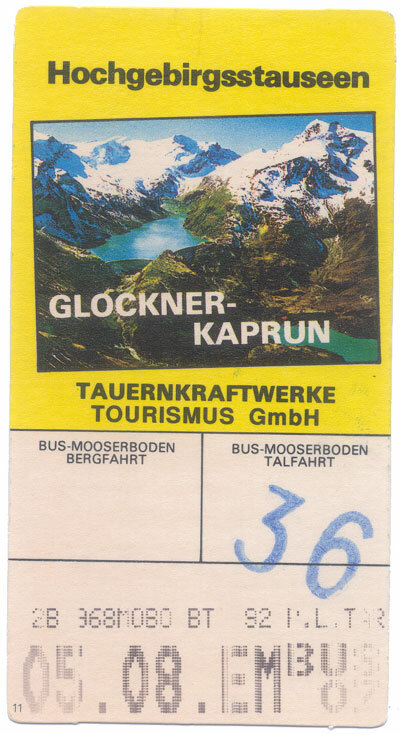 In summer, hordes of tourists are taken in special buses from Kesselfall-Alpenhaus up to Moserboden. The site of the old Moserboden hotel is now under the water. A replacement was constructed (it can be seen on the commemorative stamp), but on environmental grounds it was recently demolished. The philatelic connection? The special buses are Post Buses!